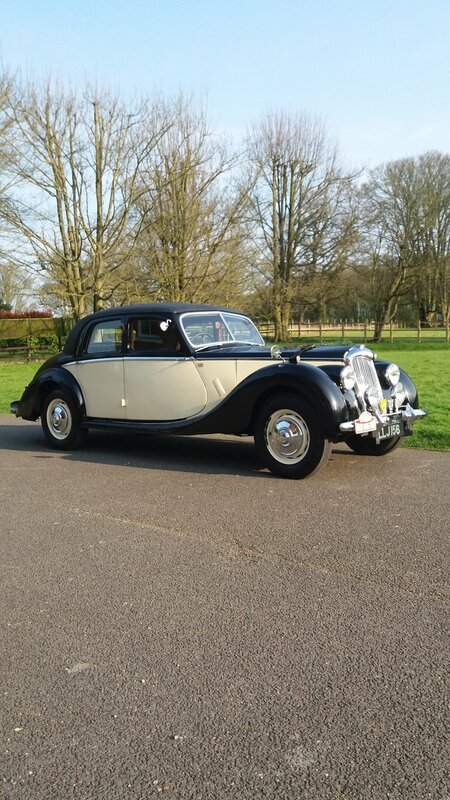 The Riley RMB saloon was launched by the company in 1946, but retained the elegance of a pre-war car as its looks were inspired by a BMW 327 of 1937 which had been acquired by the Riley family and had impressed them with its beauty. Despite its classical appearance however, the RMB boasted much post war practicality, and many technical innovations such as independent front suspension, hydro/mechanical brakes and rack and pinion steering. In 1948 Riley Motors uprated the RMB's 2.5 litre engine to produce 100BHP which was sufficient to propel the vehicle to 100mph, something attainable by only a few road cars of that period, all equipped with larger engines. 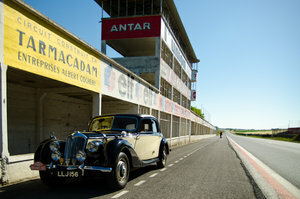 The secret to the Riley's performance lay in its famous “Big Four”, or “Blue Streak” engine designed by Percy Riley and used extensively in various forms by professional racing teams, such as ERA and BRM. The 2.5 RMB engine was very advanced for its time, having high mounted twin camshafts, hemispherical combustion chambers and twin SU carburettors. 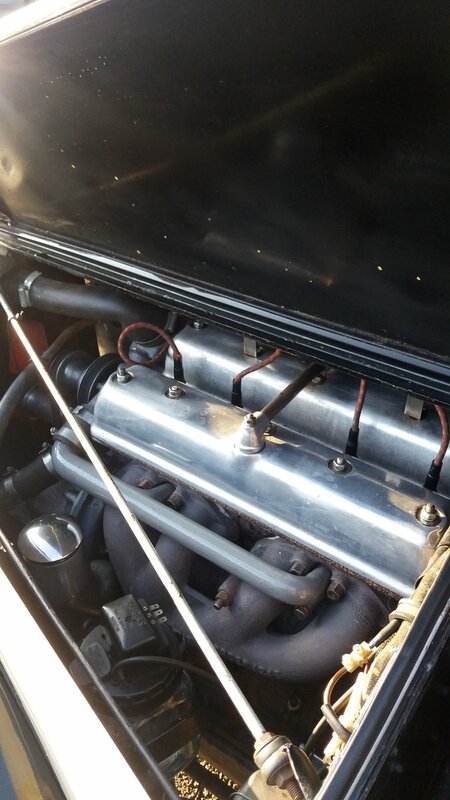 Due to post war austerity restrictions however, only one in five RM series cars built by Riley were fitted with this size engine, hence unlike their smaller 1.5 litre relatives, which many reviewers consider underpowered, 2.5 RMBs are rare and much sought after by enthusiastic drivers. When new, the hand built Riley 2.5 litre was more expensive than its 2½ litre Jaguar rival but was regarded at the time as much sportier and considerably superior in terms of both its ride and its handling. During the rebuild, it was confirmed that the engine had had a number of period Healey modifications (Donald Healey famously raced a number of Riley 2.5 engined specials very successfully) and had been fitted with high lift camshafts. Wishing to preserve the car's unique provenance, these camshafts were retained and the complex cam timing was correctly set up by specialist twin cam tuner Dave Ashford of Brunswick Racing, Cambridgeshire, this resulted in a performance output on a rolling road, greater than when the vehicle was originally built. Given its provenance, it was felt that the appearance of the car should be sympathetically enhanced to reflect its sporting pedigree and it was therefore decided to style the car as a Monte Carlo Rally team car – (the Riley RMB having been campaigned throughout the 1950s with some success.) Accordingly the car was re-sprayed in black and cream and had black leather bonnet straps fitted. The radiator grill being re-chromed to enhance the vehicle’s distinctive look. Under the bonnet, the bulky air filter was replaced with short competition ram pipes feeding directly into the car’s SU carbs to further aid performance and add to the car’s sporting credentials. 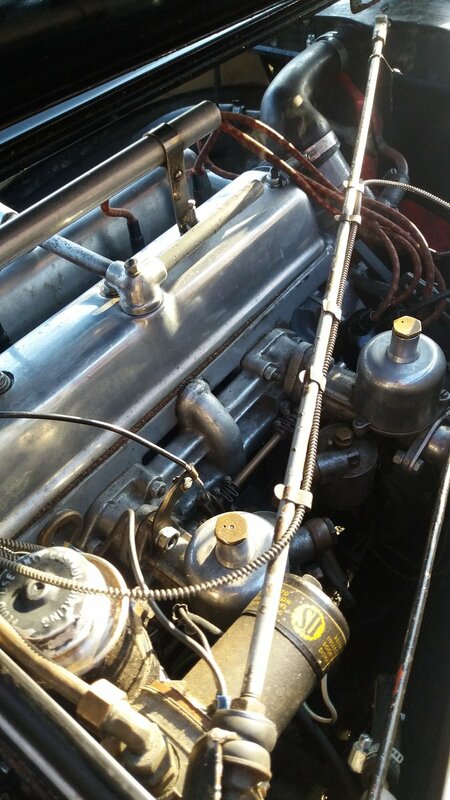 Other improvements included the fitting of a custom built high torque starter motor and a 1950s styled CD/radio. As the car already benefited from a Kenlowe fan discretely mounted in front of its radiator, no further upgrades were considered necessary in order to aid cooling. Inside, the car retains its original art deco feel with rosewood dash and door caps. 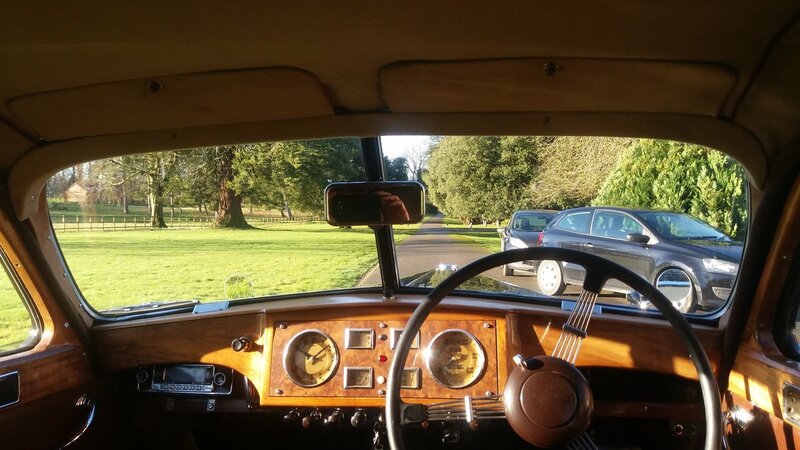 The front leather seats were professionally reconditioned by Simon Walters of Cambridge Concours in August 2018, whilst the rear seats, having sustained less use than the front, remain in their original patinated condition. The car has recently had new carpet fitted throughout. In total the car has had over £17,000 spent on it over the last 3 years in order to bring it to its present excellent condition. As can be seen from the attached photographs, the car looks the part. 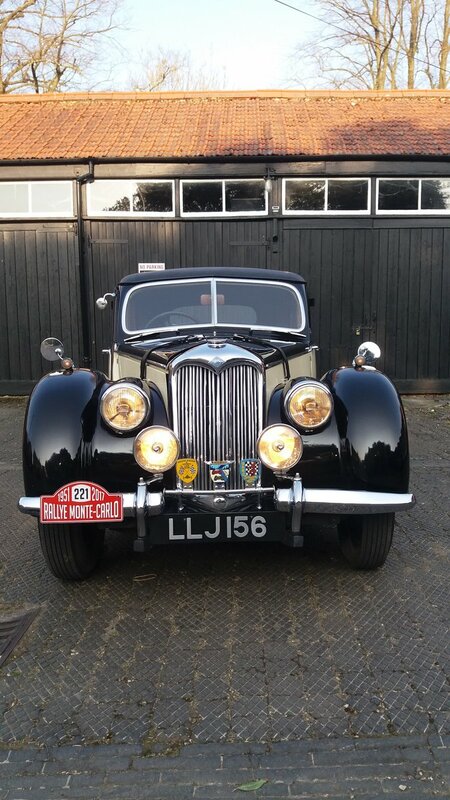 However the goal of the present owner has been to create an authentic sporting Riley capable of being driven enthusiastically, not a delicate concours queen requiring continuous attention to cosmetic detail! Although various items on the car have been upgraded to achieve this goal, all the original parts have been carefully retained and could be refitted should this be desired in the future. The car also comes with an extensive written history which references, amongst other things, the fitting of a number of Healey engine parts taken from a Lagonda hill climb car, back in the day. Unlike the 1.5 litre RM series (RMA and RME) and the later 2.5 litre RMF (with the raised roofline), examples of the early RMB rarely come up for sale, as satisfied owners tend to retain them for long periods. Those that do come to market therefore are often in poor condition requiring major expense such as new wood frames and or major mechanical reconstruction due to long term neglect. In stark contrast, this car has covered approximately 6000 miles since its engine was rebuilt, starts easily and is ready to tour at home or abroad at modern day motorway speeds, if so desired. 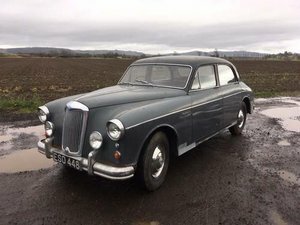 That is not to say there is no potential for any further improvement in this 68 year old vehicle, just that the present owner has achieved everything he set out to achieve and is now looking for another British classic car project to take on.